Bred specifically to hunt in packs, the American Foxhound is a scenthound that is rarely kept as a pet. In its early days its prey was the native grey fox until the later importation of the European red fox. On the hunt this breed will ignore any other prey such as deer, raccoon or rabbit, staying focused on the fox. The American Foxhound was developed from a mixture of European pack hounds brought to the United States over a period that spans hundreds of years. It is impossible to know which hounds specifically were used in its makeup, however there are two specific packs that were the basis. Pack hunting in America truly began when wealthy Englishman Robert Brooke brought his hounds to Maryland from England in 1650. These dogs would stay protected within his family for the next 300 years. 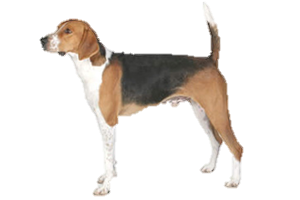 It is often stated that they were English Foxhounds, but it is important to note that his dogs were primarily black and tan instead of the classic tricolor. Due to this, it may be that the dogs were in fact Irish Kerry Beagles. Regardless, his dogs would go on to be the basis of the Black and Tan Coonhound specifically as well as other American hounds. The second substantial pack was owned by George Washington. Washington was an avid hunter and knew each of his dogs personally, we also know that his pack existed of at least two types of hounds. He began with English Foxhounds in 1770 and then French hounds of an unknown type were added in 1785 when the Marquis de Lafayette sent them as a gift. These two packs were known to have been interbred at some point, although what other breeds contributed remains unknown. Almost all of the American scenthounds can trace their ancestry back to one or both of these contributing groups of dogs.